NSCZ governs. NOWSPAR is particularly excited about this task to develop and improve sport governance standards because weak sport governance is a major barrier to gender mainstreaming in sport. NOWSPAR Executive Director, Matilda Mwaba, joined NSCZ General Secretary Man Muchimba on the Inter-Sport programme on Radio 4 to share with the nation the plans of improving and streamlining governance in Zambia’s sports sector. 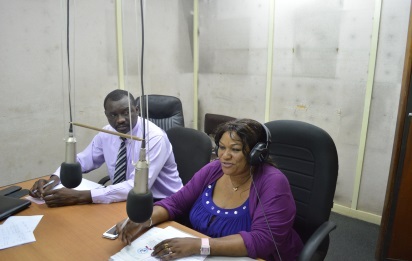 Radio 4’s estimated 4 million listeners were informed of NSCZ’s plan to ensure that sport development funds sourced from the government, civil society and corporate sector will be inclusive and managed more effectively by stronger governance structures. In addition to improving governance, Ms. Mwaba aims to ensure that the SADC Protocol on Gender and Development is honored by ensuring gender mainstreaming will be a priority for all sports bodies in Zambia. From 31st January to 2nd February, Zambia hosted the International Table Tennis Confederation of Southern African Associations Zone VI tournament. Girls and boys hailing from Botswana, South Africa, Namibia, Zimbabwe and Angola gathered at the Olympic Youth Development Center in Lusaka for the tournament. NOWSPAR awarded the Girls National Table-Tennis team with well-deserved sports gear. Ruth Banda, 13, said “This is my first time at this type of tournament and I am so proud to represent Zambia. 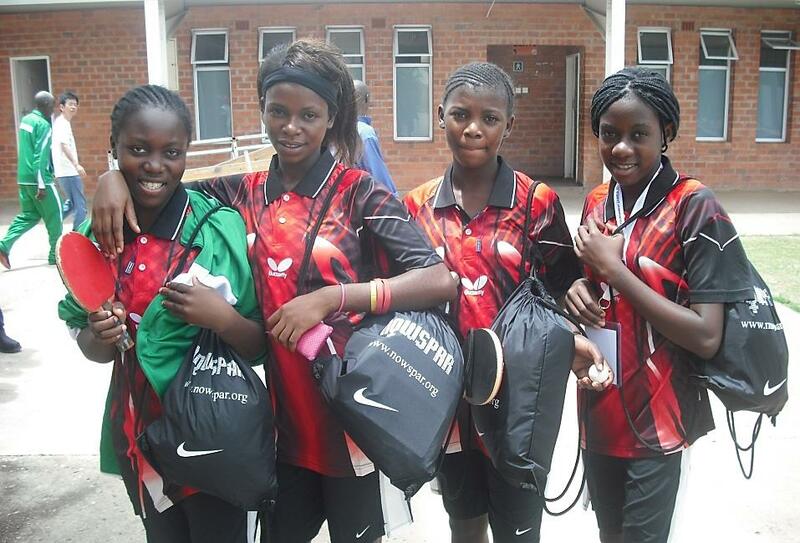 I would like to thank NOWSPAR for their continued support and for encouraging girls that it is ok to participate in sport.” The Zambian Girls Table-Tennis team was awarded the bronze medal at the end of the tournament. 21st October, 2013 marked the launch of the Kaunda Square community football league. The aim of the league was to inspire young girls to participate in sports and break the perception that girls cannot and should not participate in the same sport as boys. 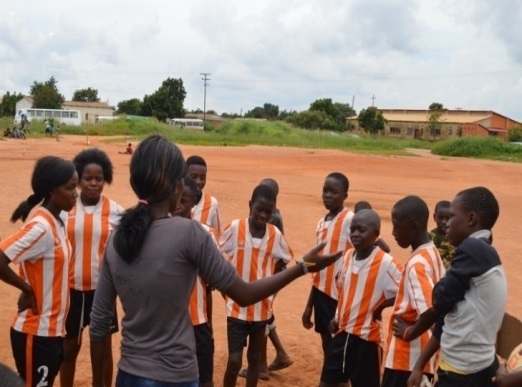 The league registered ten teams attracting 220 youths with more than 40 girls actively participating. The league has been a big success and many girls are being praised for their skills on the field. The league has also been an inspiration to the community and every Saturday, members of the community gather to watch the games thus altering how they perceive the participation of women and girls in sports. NOWSPAR has supported the community and league by including the participants in workshops such as the Safeguarding and Protection workshop. The organization has further supported the league by donating awards including footballs for the top four teams, jerseys for the winning team and NOWSPAR bags which will go to the most consistent team in the league. 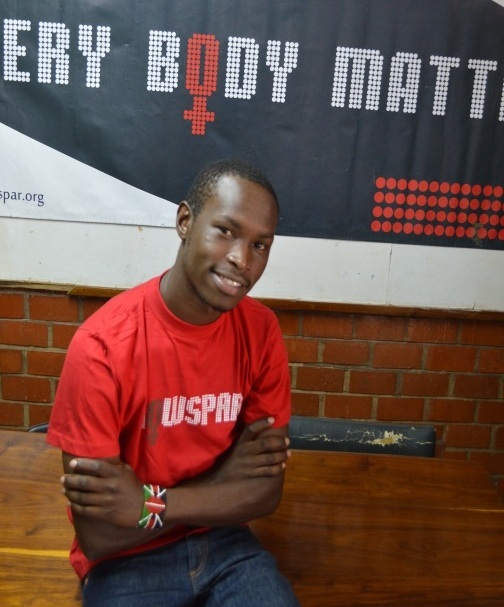 Isaac Mwaniki, YSEP volunteer from Kenya. As league administrator, Mwaniki has been able to assist with making sure the chapter gains a sustainable sports structure with the help of the community leaders. The league ended on 1st February, 2014. However, there are more teams requesting to participate in the next league which is anticipated to commence on 1st March. The main objective will be to involve more girls in the league and support girls; participation in sports. Gearing Up For International Women’s Day! The Ministry of Gender and Child Development in collaboration with other stakeholders has started planning national activities for International Women’s day that falls on 8th March, 2014. The national theme is Inspiring Change: Celebrating 50 years of Women’s Excellence and Achievements. In preparation for Women’s week and International Women’s Day, NOWSPAR will be part of the Awards Committee which will be in charge of organizing an awards ceremony recognizing and celebrating nominated Zambian women and their achievements, including those in sports. The Queen’s Baton Relay is a relay around the world held prior to the beginning of the Commonwealth games. This relay symbolizes the unity of all Commonwealth countries and territories as they come together to celebrate sport and culture. The Queen’s baton will pass through 70 countries and territories in 288 days, covering 190,000 kilometres. 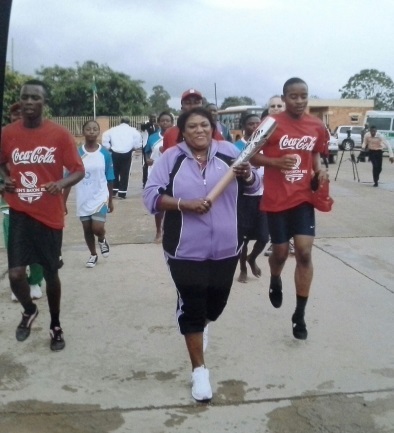 The Queen’s baton made its way through Lusaka on 28th January and NOWSPAR’s Executive Director, Matilda Mwaba, was part of the relay and the festivities where she carried the Queen’s Baton. This prestigious event was organised by the National Olympic Committee of Zambia (NOCZ). Vice- President Guy Scott flagged off the event and His Excellency, the first President of Zambia, Kenneth Kaunda also participated in the relay. 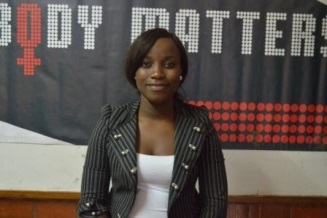 Natasha Lemba, NOWSPAR Documentation Officer, was recently selected by Amsterdam-based organization Women Win, as a Young Fellow Leader (YFL). 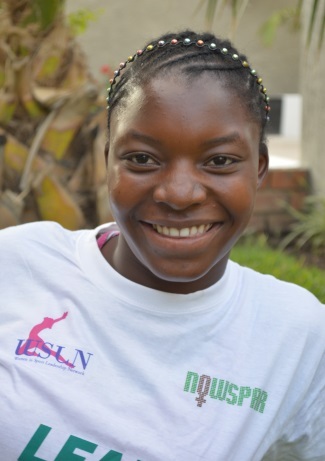 Natasha will be part of a group of young women from around the world who have been identified as emerging leaders in the sport for development field. The young leaders will participate in a Digital Storytelling and Leadership camp in Amsterdam, and will also meet with international mentors who will help them with their Community Change projects; a project that requires them to identify and address problems in their home organizations and communities. From 3rd – 5th December, NOWSPAR in partnership with Women Win organized a workshop to teach technical skills to women and girls hailing from grassroots sport organizations to tell their stories through Digital Storytelling (DST). Digital stories are narrated first-person scripts that are matched with photographs, drawings, music and sound effects to create a story that can be easily shared with a large group of people and published online to be made available to an international audience. The workshop focused on Audio Storytelling (AST) which uses voice, music and sound effects to make a recording that can be made accessible online and through other platforms such as radio and television. There were 8 female participants from sport associations and below is an excerpt of one of our participants Miyoba who is a ­­­­­ member and athlete at Miracle Disable Group. The purpose of the workshop was to equip the 8 participants with the technical skills, knowledge and opportunity to share their personal stories of transformation through sport so that their communication and leadership skills are improved, and their voices amplified. These girls in turn will share their stories and skills with other girls, women and people in their communities. These skills will also use these skills to improve their organizations’ capacities to share the impact of their work within their communities and nations.